Photographing events in Orange County is always a pleasure, particularly when the coastal skies are clear and blue. I love photographing events of all kinds, including bar mitzvahs, bat mitzvahs, private parties, children's parties and weddings. 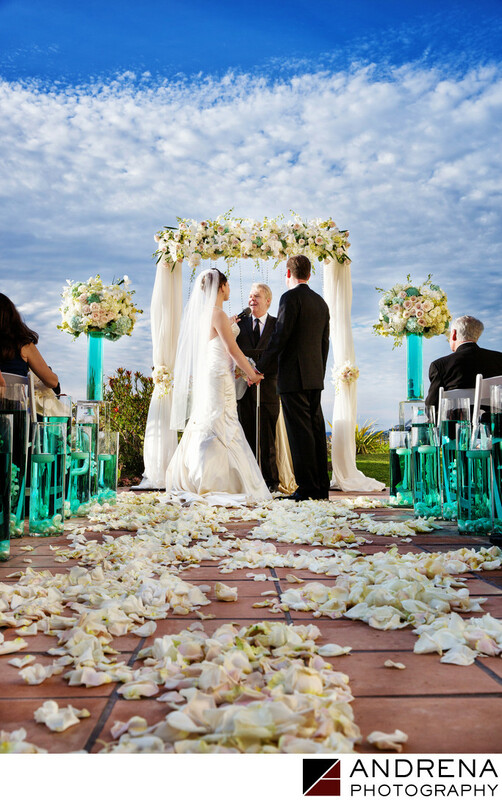 To create this image, taken during a wedding at the Ritz-Carlton in Laguna Niguel, I laid down on the ground on my chest so I could shoot the ceremony while bringing in a beautiful amount of blue sky. The low angle provides any photographer with a very different viewpoint than simply standing and shooting. I love the blue-green water in the glass pillars lining the aisle, as they add a beautiful color complement to the pastel decor used by this couple. Event photographed in Orange County, California.